After a somewhat disillusioning start to my analysis of the Golden Spiders short-listed websites I’m quite sure that things will be getting better. The next 4 categories include the Best Web Design Agency group and they, being experts in this field, are more likely to have a higher compliance with coding and accessibility standards. I wont go into the methodology used, full details of which are included in my first report (Golden Spiders Take #1). In categories 5 not one single site passed the coding and accessibility tests performed, while category 6 entertained two sites which had virtually 100% compliance (each had un-encoded ampersands or brackets within text elements). Category 7 showed some promise. bluecubeinteractive.com/property_news was fully code and accessibility compliant (although the page in question is very, very basic), and I have to tip my hat to Ulster Bank – their site was WCAG 1.0 Priority 3 compliant and the two failed tests were nominal at best (1 hours work and this could be one of the most code-compliant sites in the land). It is worth stating at this time that the tests I perform are in no way meant to be full audits of these websites’ accessibility levels. Such testing requires a more wholesome array of tests which would include subjective evaluation. My methodology is restrained purely to those tests that can be automated and require no subjective input. The Web Design category short-list contains those design agencies who, as experts in their field, should have the highest knowledge of both coding and accessibility disciplines. Well done to Lightbox.ie and Tower.ie who both achieved a very high level of compliance with the coding and accessibility standards. To be fair, a number of the failed tests in this category were marginal and those pages could be easily repaired. 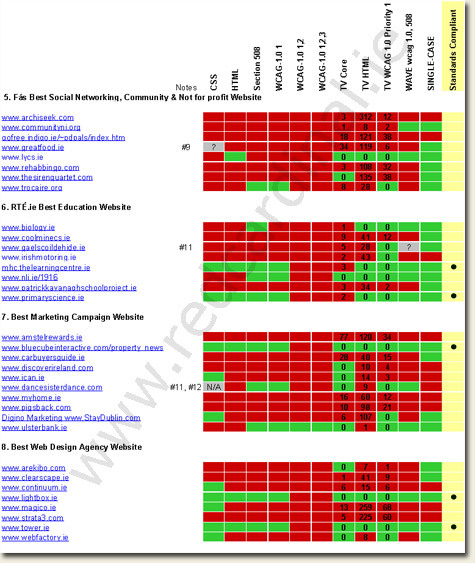 Unfortunately, I was particularly surprised at the results for Magico.ie and Strata3.com. Both pages analysed displayed an extremely high level of coding errors. One final notable point was the proliferation of dual-case coding. By this I mean the coding of some tags in lower case and others in capital or upper-case. Generally, although not always, this is a sign of ‘cut-and-paste’ re-use of old code. Within the second sample of 34 websites there was an improvement in coding and accessibility standards. ThreeFive sites fully conformed with the accessibility guidelines. A special mention of the Ulster Bank site is also worthy. CSS, HTML, Section 508 & WCAG 1.0 Priority 1 COMPLIANT: 5 (8%). Further updates will appear shortly. Again, any feedback on this is greatly appreciated. Some excellent investigation there Richard. However, let’s not get TOO bogged down in standards and accessibility. I think we also need to realise that the quality of design – layout, typography, navigation, usability and overall aesthetic competence of many, if not most, of the shortlisted sites is appalling. I agree Mojo, but the elements you mention are prone to subjective bias. I have tried to highlight an area which can be objectively evaluated. I also believe that in applying the tests above it is far more difficult to refute the findings. Had I voiced an opinion on the overall design, it would be just that, an opinion. Compliance with standards is a good starting point. If a mechanic’s work on your car didn’t render it roadworthy you’d notice immediately. Why should websites be any different? When it comes to design and functionality, what they should be looking for the the “wow” factor [horrible expression]. I have browsed quite a few of the shortlisted sites, and frankly I can see absolutely nothing that would set them apart from thousands of other websites. In my rambles I have come across lots of Irish websites that do have the “wow” factor, but of course they never are entered for the awards. And Michele is right. My idea of a good car design will be completely different from yours, but I hope we agree that any car should be roadworthy. Or, to put it another way – would you give a good architecture award to a building with shoddy foundations, just because they aren’t on general view? I was not looking forward to your analysis of this group. In our defence, Biology.ie is an old version of the site which the client has been editing themselves in Golive. The new one is rather nifty, clean and cms driven however it cant go live yet due to grant funding requirements. Nice to get you comment. I will be following up with some details on the most common errors I came across, and to be fair, quite a few problems were caused by what appear to be updates to the site content. Of course, that’s not to say there weren’t quite a few really dreadful mark-up issues. I’ll be keeping an eye out for your shiny new version.